From USA Reining – By Brad Ettleman – USA Reining, together with the United States Para-Equestrian Association (USPEA) are pleased to announce that several established and well-known Para-Dressage athletes have signed on to cross over to the sport of Reining for the inaugural Para-Reining event at the 2013 AQHA World Championship Show in Oklahoma City, November 14 & 15. Included in the ranks are a two-time Paralympian, an American disabled veteran and a host of other dedicated riders, all hoping to give Reining a try as the sport works for full inclusion in the Para-Equestrian movement. Additionally, seasoned western riders from the NRHA and AQHA ranks will step into the stirrup for the discipline of Reining at this kick-off event. First among the featured riders, Rebecca Hart was born with a rare genetic disease called Familial Spastic Paraplegia (FSP). As an adult, it primarily affects her muscles and joints from the waist down, causing partial paralysis and severe spasticity. As a child, it caused her to have difficulty gaining strength in her upper body and slowed her motor development. Rebecca began riding at the age of ten. Rebecca is a multiple USEF National Para-Equestrian Champion and was a member of the United States Paralympic Equestrian team, competing in Hong Kong with her horse, Norteassa, and taking 4th place in the freestyle. In 2010, she and Norteassa competed at the World Equestrian Games (WEG) in Lexington, KY. Rebecca retired Norteassa after the WEG. She rode Jessica and Missy Ransehousen’s Lord Ludger (LoLu) for the 2012 show season. 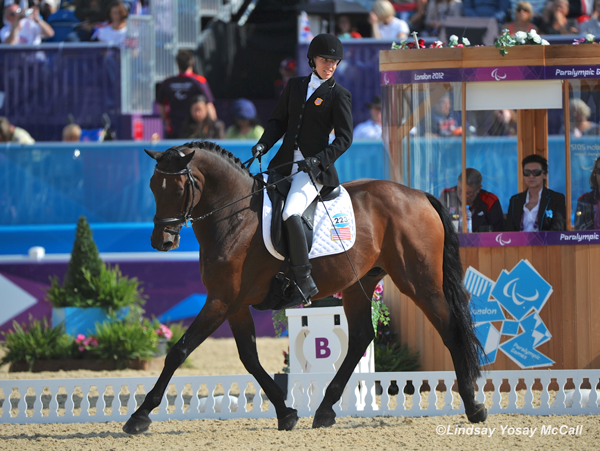 The pair was named as a member of 2012 United States Paralympic Team, competing in London. Rebecca was the Team Captain and highest scoring U.S team member at the 2012 London Paralympics. 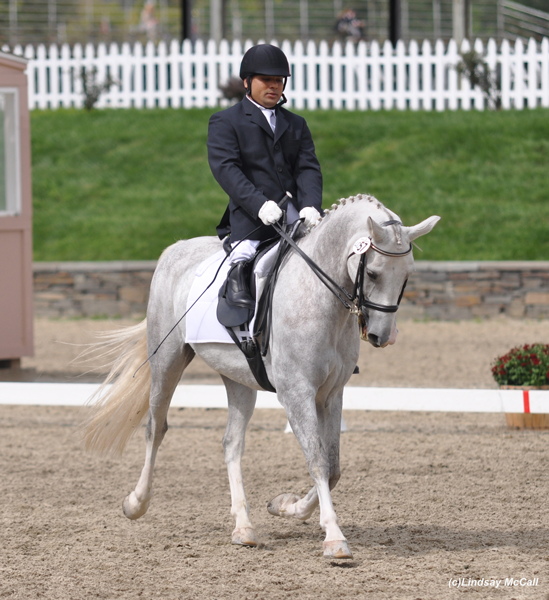 Next among our featured riders, Frederick Win was born with a congenital birth deformity. In his native Burma (also known as Myanmar), Frederick Win started riding at age six for fun. By eighteen, he was taking part in jumping competitions as a selected member of the Myanmar Equestrian Federation, jumping up to four feet. He also performed Burmese traditional trick riding routinely, doing headstands or hanging upside down on the side of a galloping horse. Since he was a teenager, he was always fascinated by American cowboy life and American justice. He decided to go to USA to study law and to learn western horsemanship. With hard work he obtained a Jurist doctor in Law. Fred currently practices law in the state of New Jersey defending people’s liberty and rights. In 2011, Fred started learning dressage and successfully competed at the United States Dressage Federation national level and FEI international level shows. Fred is honored to join the ranks at the first ever Reining demonstration. Also featured, Derrick Perkins is a U.S. Air Force veteran who was injured in 1988 while on active duty. After his initial physical rehabilitation, he was stabilized as a tetraplegic with significant loss of use in all four extremities. Since then, he has become a member and volunteer of the Paralyzed Veterans of America, Texas Chapter and began participating in various wheelchair sports for recreation, physical rehabilitation, and the thrill of competition. Derrick has competed annually in the National Veterans Wheelchair Games and has a closet full of medals. He was recommended, by friends, for the SIRE – Houston Therapeutic Equestrian Centers program in 2008. During his years of riding with SIRE, Derrick has seen unbelievable improvements in balance, strength, and coordination. 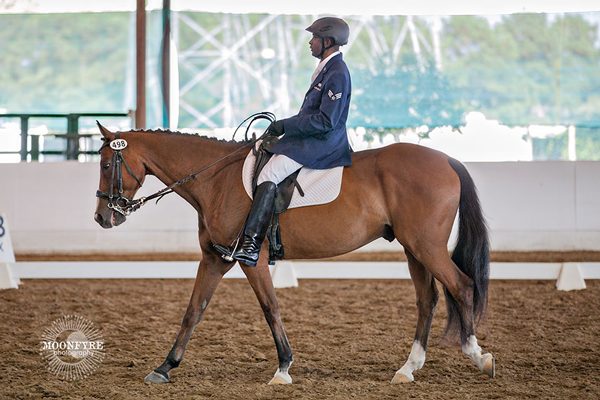 Derrick has multiple awards, titles and championships from top events and organizations and is an FEI-rated international rider, and is currently competing for a chance to represent the United States in the 2014 World Equestrian Games and the 2016 Paralympic Games. To be featured at the 2013 AQHA World Championship Show in Oklahoma City, OK, Para-Reining will include a clinic and educational seminar on Thursday, November 14, and a first-ever Para-Reining demonstration class on Friday, November 15. This demonstration marks the maiden Para-Reining event ever to be held within the US Para-Equestrian system and a launching of efforts to bring the discipline online as a fully recognized sport in 2014. USA Reining and USPEA together with the AQHA and NRHA are proud to welcome an American hero to our ranks of Para-Reining competitors. The National Reining Horse Association, partnering with their supporting entity, the Reining Horse Sports Foundation (RHSF), is proud to implement an Adaptive Reining Program beginning in 2014. As the standard setting-body for the sport of Reining world-wide, NRHA will approve and recognize Adaptive Reining classes and bring the sport to reining enthusiasts of all ability levels. The program’s standards, rules and policies will ensure NRHA’s ability to offer an inclusive, safe and fun environment for para-equestrians worldwide. RHSF will support the program in the form of scholarships and NRHA Affiliate grants that may be used to award prizes for Adaptive Reining classes. NRHA is proud to partner with the American Quarter Horse Association, the United States Para-Equestrian Association and USA Reining to champion the cause of para-equestrians. For more information about USA Reining, click on www.USA-Reining.com. For more information about the American Quarter Horse Association World Championship Show: http://www.aqha.com/Showing/World-Show/Schedule.aspx.